MOSCOW, July 1, 2018. 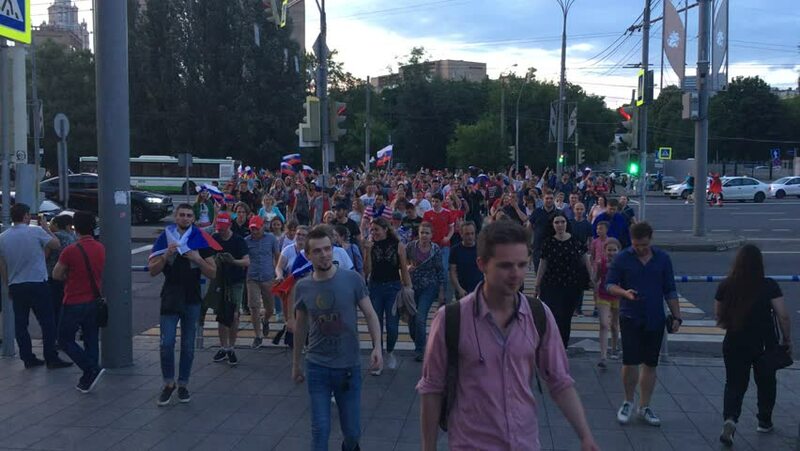 A group of Russian fans are returning from the Fan Zone to transport. The period of the International FIFA World Cup 2018 in Russia. hd00:06Barcelona, Spain, 9th July 2016: Gay Pride Barcelona. Pride parades are events celebrating lesbian, gay, bisexual, transgender and intersex (LGBTI) culture and pride. 4k00:10La Paz, Bolivia. Circa 2019. Protest of miners workers in the center of the city for the rights. hd00:10BERDYANSK, UKRAINE - MAY 5, 2016: Public city exhibition of military equipment, weapon and celebration of 2-year anniversary of creation of the regiment "Azov" on May 5, 2016 in Berdyansk. 4k00:52Yamada area Chichibu city Saitama prefecture JAPAN, March 12 2017: Spring festival with people pull a float around through the streets in the area. The festival held on second sunday in March.